Tips you can use to help raise kids who aren’t afraid of food. It’s better to learn by example, always be positive when offering food and show children how much you like a food when you’re asking them to eat it. To help your kids develop that healthy relationship with what they’re eating (and avoid daily dinnertime rows), here’s what you should know. The battle may start because of the green beans, but most of the time for the picky eaters, it’s not the green beans, the peas or even the elusive dessert, that’s upsetting them, explains Dina Rose, PhD, a sociologist and author of It’s Not About the Broccoli. A lot of the time it’s a control struggle, she says. As toddlers, it becomes a kid’s job to learn control — how to move and control their body and all of its functions. Choosing what foods to put on their plate and choosing whether or not to swallow that food is another ripe area they can control, Rose says. Kids sense the pressure and get that mealtime is something parents really care about, Rose adds. The power struggle begins. The green beans are the chore that needs to get done, and the gooey brownie is the reward. Even though the kid might learn he or she needs to eat the vegetable, we’re not teaching the kid to prefer it. Power struggles can teach kids the wrong messages about food. When a kid rejects a certain food and we put pressure on the kid to eat that food, it becomes a negative experience, Rose explains. How many of us have been told or told our kids: “Two more bites and you can have dessert”? “That makes the dessert valuable and the vegetable not valuable,” Rose says. The green beans are the chore that needs to get done, and the gooey brownie is the reward. Even though the kid might learn he or she needs to eat the vegetable, we’re not teaching the kid to prefer it. Problem two: we give kids the wrong vocabulary when it comes to food, Rose says. Maybe they don’t want to eat a food because they’re cranky, they’re not hungry, they had their hearts set on something else for dinner — whatever the reason — but they say “I don’t like it” so that they don’t have to eat it. “We systematically teach children that the only ‘legal’ way to get out of eating a food is to say, ‘I don’t like it,’” Rose says. One well-cited theory on discouraging picky eating encourages parents to share responsibility with their kids when it comes to eating. Parents control what food is available and when and where meals and snacks are eaten; kids determine how much they eat and whether to eat. Registered dietitian Ellyn Satter developed the theory — coined the “Division of Responsibility in feeding” model — in the 1980s and 1990s. Versions of the model are part of nutrition guidelines for children and adolescents that come from The Academy of Nutrition and Dietetics and The American Academy of Pediatrics. And it’s influenced a lot of healthy eating strategies for kids that are taught, advocated and followed today, Rose says. An exposure might be looking at a food in the serving dish, listening to a parent talk about eating it, helping prepare the food, feeling the food or trying a nibble of the food. Put too much pressure on a kid to like the food right away and if there’s any reason a kid doesn’t want to eat that food, it gets put into the “don’t like it box” — and it becomes tougher for the next exposure to go well, Rose says. 2. Change up the menu. Kids need to learn this early and they need to learn not to expect to get the same meal served to them every day. And — when appropriate — give kids options when it comes to eating, Rose says. This helps teach decision-making when it comes to feeding. 3. But don't make separate meals. Catering to kids’ picky preferences drives the pickiness and never gives them a reason to try new foods, explains Sally Sampson, co-author of The Picky Eater Project and founder of ChopChop, a non-profit that teaches families about cooking together. It can be an attention struggle: Mom needing to get up and make a separate dish means more attention on the child, making them feel doted on or special, Sampson adds. What incentive is there then to be the kid who doesn’t require that extra attention? “[Don’t] give the picky eater a lot of ‘air time,’” Sampson says. 4. Give kids options you want them to eat. If you don’t want kids to pick macaroni and cheese, don’t make that one of the options, Sampson says. That doesn’t mean you need to have a kitchen full of wheat germ and kale, but it’s important to surround kids with good options — when it comes to what’s being served, what foods you’re talking about, and what kids are eating when they’re outside your kitchen — so they can make good decisions. 5. 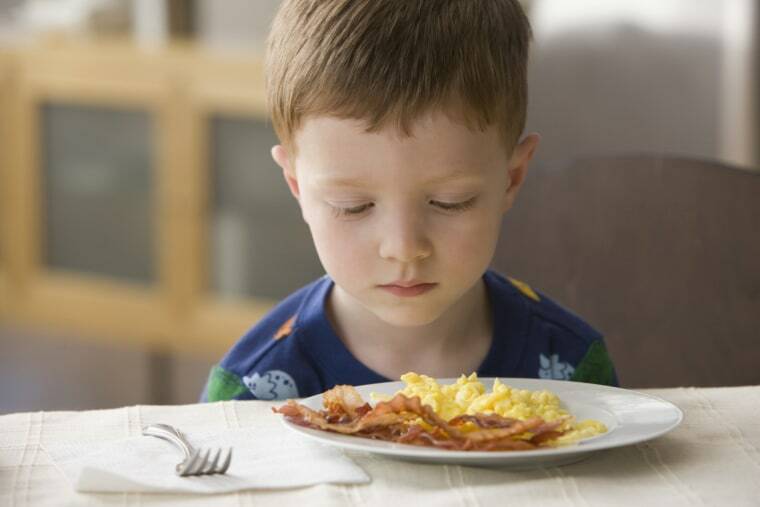 Separate behavior issues from picky eating. If a child is screaming or throwing a tantrum at the dinner table, that’s a behavior issue, not a picky eating issue, Rose says. And behavior issues need to be dealt with appropriately. If behavior problems get treated as picky eating problems, they make that entire feeding experience negative — and that negative environment won't allow kids to give any new foods a chance. 6. Involve kids in meal prep. Involving kids in meal prep makes them active participants and gives them a sense of control from the very get-go, Sampson explains. Have kids help pick out groceries, prep food and set the table. It keeps kids’ curiosities peeked, so they want to be part of the end result: eating the dinner. 7. Don’t ban sweets, help kids manage when and how they eat them. Forbidding sweets entirely can backfire, potentially leading kids to overindulge or abuse them when those foods are available, she adds. Give kids a candy drawer that they can reach and talk to your kids about what amount of sweets is appropriate for them to be eating, Rose suggests. Maybe that’s one treat a day. If Johnny decides to eat a piece of candy after lunch as his sweet for the day, he may need to skip having a cookie after dinner (even if his sister decided to have her sweet for the day then). That’s a learning opportunity, Rose says. “If a parent feels like his or her kid cannot be trusted, that’s a trust issue not a food issue,” Rose adds. 8. Relax, enjoy it and make mealtimes the positive experience they should be. For a lot of kids, becoming a picky eater is a mechanism that solves some sort of unrelated problem for them — it eliminates pressure or gives them control, Rose says. It’s not about what’s actually on the plate.